• CERN officials and National Institute for Subatomic Physics, or Nikhef, are teaming up with HighTechXL in a concentrated effort to push research out of the lab to innovators in Eindhoven's high-tech ecosystem. • Han Dols, CERN knowledge transfer officer, laid out the challenge: “Can we find the technology from physics that can make a positive impact on society?” CERN is best known for particle research using linear accelerators and several colliders in Switzerland including the Large Hadron Collider to find the"God Particle." Watching engineers, physicists and entrepreneurs turning CERN research into new companies, one can’t help wondering if we're watching history being made. After all, CERN created the World Wide Web. 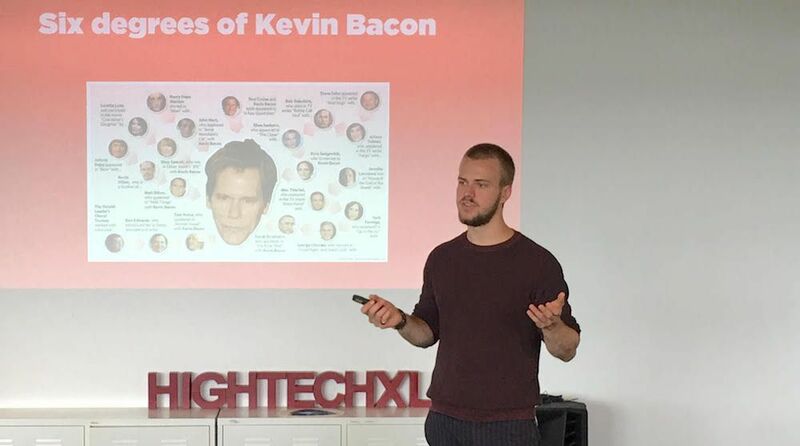 Thibaut Decré, a team member and HighTechXL acceleration manager, explains the importance of building networks during the business model canvas session. On Tuesday, HighTechXL took a giant step down the road to turning CERN research from esoteric concepts to essential new products. Evaporative cooling using carbon dioxide is a technology for systems with high power density, providing highly stable and efficient cooling using small pipes that can extend over long distances. A simple, low-cost system and method for generating a structured laser beam that can transmit over large distances while maintaining a low divergence and small central spot size. As part of the Medical Applications Programme at CERN, researchers developed a novel, very compact high-frequency radio-frequency quadrupole linear particle accelerator. In the preceding weeks, some of the hackathon ideas have been refined and reimagined, and at least one completely new effort created. In the coming weeks, teams will perfect their concepts and add personnel on the way to going to market. They'll also focus on customer validation and initial partnerships. Then the three-month CERN technology business accelerator starts 24 September 2018 at HighTechXL. • robotic vehicles equipped with sensors using CERN’s small quadrupole linear particle accelerator roam farms generating incredibly accurate soil quality analysis. What is a major disruption in agriculture worth? Try a projected $1.5billion. HighTechXL CEO Guus Frericks says CERN moved his accelerator teams off the sidelines and into the fray. • CERN’s structured laser beams are used for inter-satellite communication … technology that could make delivery of high-speed communication systems cheaper and available to everyone. What would that be worth? A LOT! • CERN’s small particle collider disrupts the global healthcare industry, used in a compact device that provides the isotopes needed for PET scans anywhere, even in small hospitals in isolated communities. What would that be worth? How do you put a value on saving lives? • devices incorporating CERN’s particle accelerator scan cargo and package's faster, more efficiently and on a far larger scale than possible in today’s heavily labor-intensive processes. What’s that worth? Well, you’d start with the current $9.1 billion security scanning market. The CERN project changes his tech accelerator's dynamic, said Guus Frericks, HighTechXL founder and CEO. He and his team have gone from coaching startups to actually founding startups based on CERN technology. 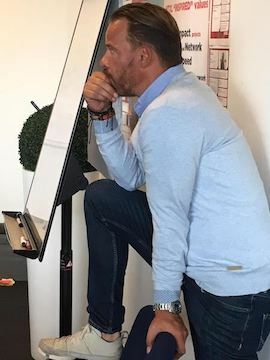 “HightechXL is used to coaching … standing on the sidelines. Now, we’re involved." Frericks said. “If you look for technology where you expect to find it, you’ll never find something new,” Dols told the assembled teams. This team is led by Przemek Krawczyk, a professor originally from Krakow. Modular Energies is different from the other teams in that Krawczyk founded it before the CERN hackathon with his own network of physicists and others from Jagiellonian University in Amsterdam. Krawczyk's concept is to use CERN’s portable particle accelerator to build a small plug-and-play device for on-demand production of radioisotopes for PET scans.Typically, those radioisotopes are made by large cyclotrons. The compact size, safety and low cost of ownership could lead existing facilities to adopt his device, Krawczyk said. The market is worth an estimated 60 million euros, but is growing 11 percent per year, he said. Modular Energies is seeking 4 million euros to build their prototype, but Krawcyzk envisions having a Beta version in healthcare facilities within two years. His team has proof of concept, mapped supply chain, key partners in Eindhoven and initial customer validation. They need detailed market analysis and launch customers, Krawcyzk said. This Dynaxion team had two application areas. Dynaxion SQCis developing unmanned devices for soil analysis, said Cor Datema. Datema's team proposes using CERN’s small particle accelerator to analyze soils. Rather than random soil testing, Dynaxion would let farmers to know if soils have the essential elements and minerals in the right ratios for optimal crop production and precision farming. Dynaxion’s tech could be used, for example, to selectively apply insecticides or fertilizers only where needed, even down to a single plant. The Dynaxion team includes Thibaut Decré, Cor Datema and Fabiola Jimenez. The growth rate of international trade is slowing simply because of the sheer amount of goods that must be scanned by security, about 80,000 containers per hour. If Dynaxion BPI can perfect the technology to use CERN’s small particle accelerator on a large scale for greater speed and resolution, they could speedup the inspection process. Thetechnology could be expanded from container ship ports to airports and mail operations. “The faster we can scan, the larger the market," Decré said. The PBI team includes Decré, Datema and Jimenez. Microspot proposes using CERN’s structured laser beam that can project over long distances while maintaining a low divergence and small central spot size. Team leader Luis Oliveira said the problem Microspot solves is that current communications infrastructure is insufficient to allow price-effective expansion of fibre optics, and – by extension – upgrades to 5G networks from 4G. Communication companies are now assembling constellations of satellites, but satellites have bandwidth and expense issues. The Microspot solution: structured laser beam for inter-satellite communication. Such a system requires smaller devices, offers longer transmission distance than conventional tech with lower energy costs. Other applications include aviation, last-mile transmission solutions, off-shore communications, and LIDAR, the system for autonomous vehicles. This will be complementary to fibre optic networks, not replace that technology, Oliveira said. The team includes Oliveira, Guido van Katwijk, Joost Versteijlen and advisors Guus Frericks, John Reid, and Eddy Allefs. Named after the coolest planet in the solar system, this team is focused on the proposition that CERN's CO2 cooling technology outperforms water cooling systems, said Yama Saraj. So Neptune is creating the first customizable thermal control system. "Because everything in high tech is getting smaller, the problem of thermal stability is getting bigger," Saraj said. He used a darts analogy: As the dart board gets smaller, it's harder to hit the bullseye. The current generation of equipment uses water cooling to try to maintain a constant temperature. "For next-gen tech, that's not good enough," Saraj said. "Water gets warmer and warmer, and the result is uneven thermal behavior." CO2 has 20 times better thermal stability with lower energy consumption. The Neptune Cooling team is Yama Saraj, Sudhir Srivastava, Mahmoud el Abbassi andRamon Haken. As ASML's Rob van der Werf noted during the Neptune presentation, "Temperature control is easier with CO2 than water. We have no problem cooling. We have problems with temperature control." Eindhoven-based ASML makes room-sized machines that allow companies to make computer chips. The company is sponsoring the CERN collaboration. The CERN Solar’s team is “fighting fire with fire," said Rudie Verweij, reducing CO2 greenhouse gases by optimizing solar panels with CERN’s CO2cooling technology. Heat decreases solar panel efficiency, “but unfortunately, solar farms tend to be built in the middle of the desert where water is in short supply, Verweij said. The CERN technology provides highly accurate cooling over long distances and requires no refrigerants. Cooling all the world's solar panels by 10-percent would add enough energy to power 14.9 million homes. CERN technology can be used to cool data centers, batteries at wind farms and batteries in electric cars. CERN Solar team includes Yvonne Boesten, Rudy Verweij, Aroop Bhattacharjee. The day included seminars on financial modeling, refining business plans and product validation. “If you look for technology where you expect to find it, you’ll never find something new,” Han Dols told the assembled teams. Now that these teams have advanced to the next level, they need to recruit members to support their businesses. 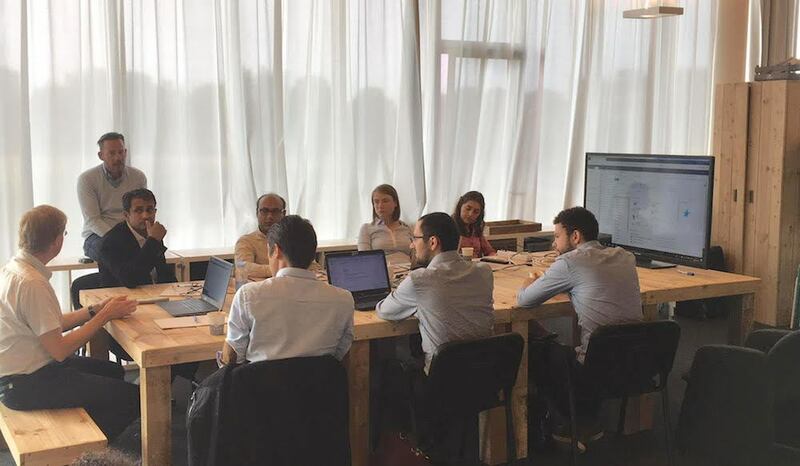 On September 13, 15 and 18, there will be matchup events at HighTechXL, giving CERN teams the chance to recruit new co-founders, members and mentors as they prepare to start the 3-month accelerator program later this month. And don’t worry … you don’t have to be a physicist to be part of an innovation team. They need marketers, designers and financial types also. You can find more information on those events here. Startups have to present a bankable business case by 18 December, said Frericks. “You should be ready to talk to investors,” Frericks said.